Invisible men were nothing new on film or TV when Dr. Westin had his unfortunate accident. Back in 1933, for instances, horror veteran Claude Rains had portrayed the lead character in James Whale's The Invisible Man. The Invisible Man Returns followed in 1940, this time starring Vincent Price as the luckless scientist. It was the espionage thriller Invisible Agent, however, which pitted John Hall against the Axis forces in 1941, that most closely mirrors the format of the McCallum TV show. There was also an Invisible Woman in 1941, and an Invisible Boy in 1957, while everyone from Disney to Charles Band has had a go at exploiting the concept since. Invisible monsters abound in TV episodes (Lost in Space, The X-Files, etc.) and films (memorably Forbidden Planet and Predator) too, while the more obvious human delights of invisibility have been explored in various lame teen comedies (Zapped and The Invisible Maniac spring to mind). More restrained mischief-making is to be found in TV's Topper, Randall and Hopkirk (Deceased), and Quantum Leap, or cinema's Abbott and Costello Meet the Invisible Man, Ghost, and Memoirs of an Invisible Man, among others. "Regular" TV heroes who've enjoyed brief spells of invisibility include the original Star Trek's William Shatner and three Next Generation crew members, Time Tunnel's James Darren, and--bizarrely!--Magnum's Tom Selleck. 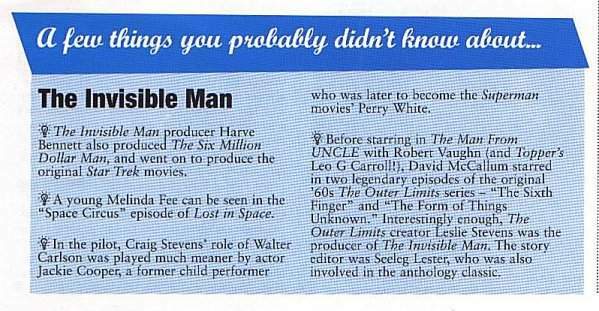 For all the diversity of his roles on TV and occasionally--the cinema, David McCallum always seems to be playing David McCallum, and The Invisible Man was no exception. He's a likeable guy, all the same, and makes for a charismatic hero. 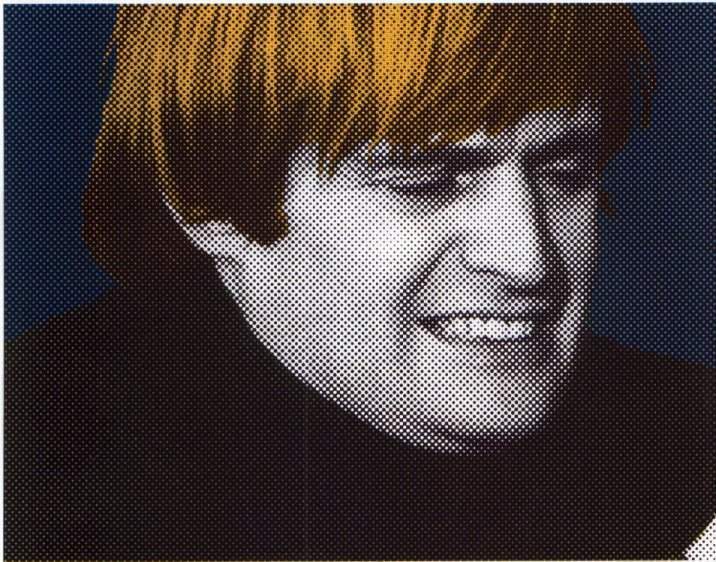 There's no trouble finding him today, either--he's escaped the obvious typecasting as Illya Kuryakin of the Man From UNCLE by making many other TV and film appearances. In Britain, he's starred in shows like the serials Kidnapped and Colditz (recently reshown on UK Gold), as well as the oddball '80's Joanna Lumley co-starrer Sapphire and Steel, now reshowing on Bravo. More recently, he's been seen in Britain in the series Trainer, and in the US guested on Babylon 5 and co-starred in the cancelled VR5, soon to be shown on British TV. Craig Stevens--blandly amiable and pally as the new 'viewer friendly' Walter Carlson (as with The Six Million Dollar Man, the mean and self-interested boss from the pilot was given a genial facelift for the series)--was at the end of his career in '75. Back in 1964, however, he was charming the ladies as "Mr. Broadway." Earlier still, in the 50's, he was a frequent guest player in various drama series and enjoyed fame as TV cop hero Peter Gunn. 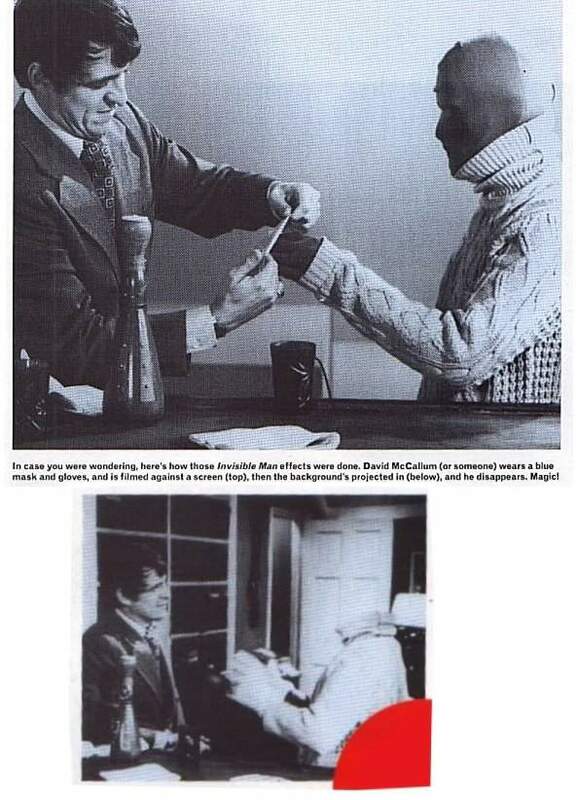 When The Invisible Man ceased productive, however, he acquired a role in the popular mini-series Rich Man, Poor Man, and appeared in some episodes of Dallas in 1981. 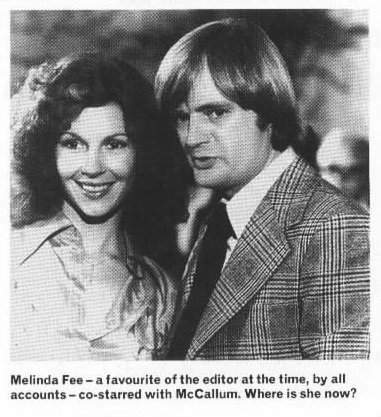 Of Melinda Fee, however--so perky as McCallum's wife Kate--there has been no sign. Perhaps she became invisible herself! 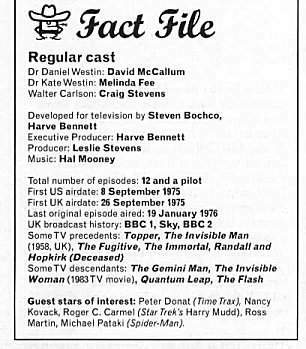 Although The Gemini Man, which revamped The Invisible Man concept the following season, was a blander show, at least it avoided the biggest problem McCallum had by having the hero simply flip a switch to become invisible. The trouble with The Invisible Man was that, while it was inventive (and "realistic" after a fashion), the weekly rubber mask rigmarole took a lot of effort to film, and remained highly unconvincing. The blue screen work, although vastly superior to British efforts at the time, always looked painfully fake. And that wasn't the only criticism....The face mask McCallum waved about when changing back and forth was clearly not capable of representing McCallum's features well enough to fool anybody, and no one to date has made an 'invisible man' show where the objects being mysteriously moved around don't bob up and down as if being carried by a Thunderbirds puppet. It was also odd, as many viewers commented on at the time, to think that Westin was performing all his missions in his birthday suit! A bigger problem was voiced by McCallum himself--he hated the lighter scripts that followed writer Steven Bochco's pilot (Bochco was later to create the highly successful Hill street Blues, LA Law, and NYPD Blue), saying the he'd "signed up to do The Fugitive and ended up doing Topper." And light the scripts most definitely were--the first episode had McCallum and wife (Melinda Fee) doing a cheating-the-cheaters scam that was already old when Mission: Impossible did it. Another one went for the fake spiritualist/haunted house cliche, while similarly predictable (if slightly superior) was "Sight Unseen", in which Westin rescues a blind girl from gangsters (think about it!). There were better episodes, however, "Go Directly to Jail" was another Bochco script, and had one of his typically clever ironies behind the premise, while "Attempt to Save Face" was a clever idea inside a stupid plot. Of them all, though, perhaps the best was "Power Play," which had an escapee from an insane asylum discover Westin's secret within the KLAE laboratories. This episode tied in with the earlier "The Klae Dynasty" another of the better episodes, in which Westin played an invisible bodyguard.